Take a look at the common misconceptions about fire sprinkler systems and the truth behind the myths. Unfortunately, there are a lot of misconceptions about fire safety and protection, and it’s important for people to separate the myths from the facts. 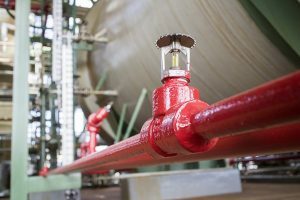 For instance, sprinkler systems have been used in buildings for years and are proven to protect occupants and properties from fires, but there are still many myths surrounding the fire protection systems. Continue reading to learn the truth behind these misconceptions about fire sprinklers systems. This common statement that smoke alarms provide enough protection against building fires is simply untrue. Smoke alarms are important fire protection equipment, but they only alert occupants of smoke or fire, and do nothing to extinguish it. Fire sprinklers are crucial for reducing heat, flames, and smoke from a fire to give building occupants enough time to get out safely. Also, while smoke alarm reduces the chances of death by fire in half, sprinkler systems in homes reduces the risk of death to about 80 percent. This is a common misconception because many people think all sprinklers in their building will go off in the event of a fire. However, water damage from a sprinkler system is typically not severe, especially in the event of a small fire. Sprinkler heads are activated individually, so it’s very rare that all of the sprinklers in the building will go off in the event of a fire. In fact, 90 percent of all fires are controlled with six or fewer sprinkler heads. It’s also important to note that water damage from sprinklers is much less severe than damage caused by firefighting houses, as the houses release 80-125 gallons of water per minute, compared to 8-24 gallons of water per minute from quick response sprinklers. This statement is completely false, as sprinklers provide a high level of life safety for occupants in commercial and residential buildings. The combination of sprinkler systems with other fire protection equipment in all buildings reduces property damage as well as loss of life by at least 50 percent. This entry was posted on Wednesday, April 11th, 2018 at 11:27 am. Both comments and pings are currently closed.